So, here’s my obligatory Back-to-the-Future Day post and, because it is me doing this, it’s obviously about chemistry publishing. I figured I’d compare one issue of a journal published in 1985, with an issue published in 2015. Because the last time I looked at chemistry publications over a particular period of time I chose JACS, I thought I’d do Angewandte Chemie (the English edition) this time so that my friends over at Wiley don’t feel all left out. So, I looked at the October issue from 1985 (yes folks, there was only one issue of Angewandte each month in those prehistoric times) and compared it with the October 26th issue from 2015 (which is 5 days from now – and that seems appropriate considering the time-travel inspired nature of this post). 1. Papers now have more authors on them than 30 years ago. The average (mean) for a paper in the 1985 issue was 3.07 authors, whereas it is more than double that in the 2015 issue at 6.37 authors per paper (the medians are 3 and 6, respectively). 2. Papers are now longer than they were 30 years ago. The average page extent for a paper in the 1985 issue was 2.15 pages, whereas it is now more than double that in the 2015 issue at 4.86 pages per paper (that’s just based on page ranges; not full printed pages in the journal). For comparison, the medians are 2 and 5, respectively. 3. The geographical spread of corresponding authors is much greater now than it was 30 years ago. 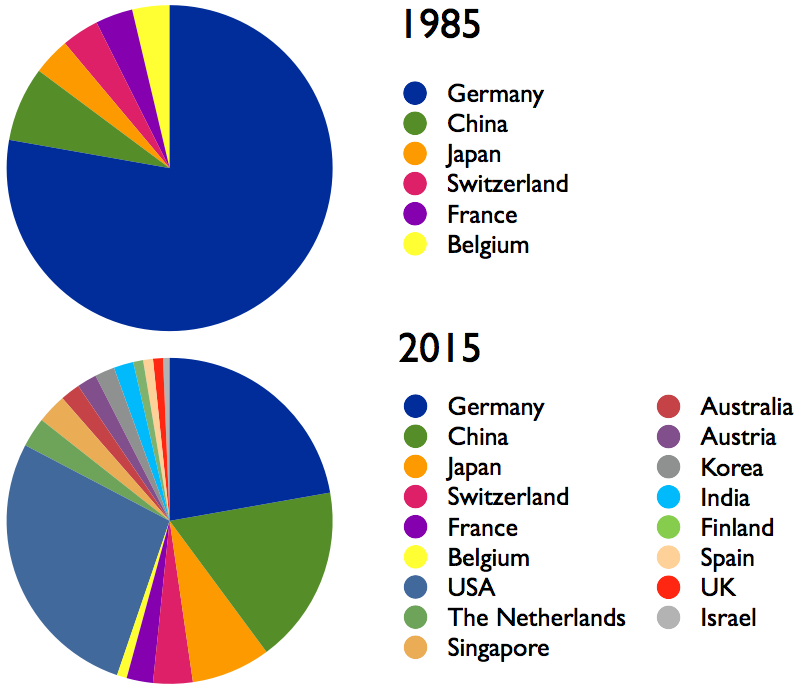 In 1985, German authors dominated Angewandte Chemie, but that’s not true anymore it seems – just look at the charts below. Breakdown of geographical location of corresponding authors in Angewandte Chemie. As I mentioned above, these are really small samples so do take the analysis with a pinch of salt. That said, @fxcoudert has looked at these trends in more depth in the past and I highly recommend that you go and check out these two blog posts here and here. I don’t know if this counts as #OldTimeChem or #FutureTimeChem (or perhaps a bit of both), but anyway, this is my little bit for #RealTimeChem week 2015! This entry was posted in Carnivals, Fun, History of science, Publishing and tagged angewandte chemie, authorship, back to the future day, chemistry, chemistry publishing, editorial, papers, publishing. Bookmark the permalink. Re: paper lengths, since you’re looking at comms then I assume page limits will be a big factor in that change. If memory serves ACIE used to have a three-page limit, which was increased to four and then five a few years ago. Be interesting to see the numbers for full articles—gut says that these may be shorter now in some fields, eg org syn where it’s increasingly common to stick all the preps in the SI. Yeah, point well taken – someone should do the same analysis for JACS. Angewandte only has ‘Communications’. So, for this very small sample, full papers in JACS have only got slightly longer in the last 30 years, so @fluorogrol‘s point about page limits is a very relevant one.